Reliable Controls is very pleased to announce that the MACH1™, MACH2™, and MACH-Vision™ have been officially added to the BTL listings. Our latest BTL listings join the MACH-Air™ and MACH-Zone™ which were listed in September of 2003. The MACH-Global™ controller and ETHER-Link™ portal are expected to gain BTL listing in the Spring/Summer of 2005. All controllers meet or exceed the BACnet® Application Specific Controller profile. 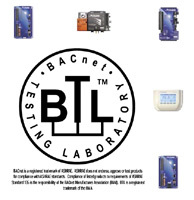 The BACnet® Testing Laboratories (BTL) are a branch of BACnet® International. BACnet International offers a product testing and listing program for products that have BACnet® capability. The BTL's authorized test laboratories test the BACnet® functionality of a product to a set of requirements developed by the BTL that are based on ASHRAE Standard 135.1P. A product must meet the BTL's mandatory requirements to be eligible for BTL listing. For official listings, please visit the BACnet® International Product Catalog.